Zhao, C. (2014). Wnt Reporter Activity Assay. Bio-protocol 4(14): e1183. DOI: 10.21769/BioProtoc.1183. This protocol is for testing responses of a candidate cell line/cell lines to Wnt ligands or Wnt pathway agonists stimulation. This protocol can also be adapted to screen small molecule libraries or biologics that contain activities to either increase or decrease Wnt pathway responses. Canonical Wnt signaling activity transcriptionally induces Wnt target genes that contain concensus TCF/LEF binding element. Wnt pathway activity responsive cells transiently or stably expressing luciferase proteins under the TCF/LEF promoter element can be used to report stimulus-dependent Wnt-pathway activity. We acquired the TopFlash (TCL/LEF-Firefly luciferase) construct from Addgene. Note: The pRL-SV40-Renilla luciferase expression construct is made at Dr. Beachy’s Laboratory. Briefly thaw cells at 37 °C water bath. Pipette cells into 15 ml thermal scientific Nunc conical tubes and spin for 5 min at 1,500 x g. Aspirate media, re-suspend cells in 15 ml growth media and plate in T75 culture flask (Cells are plated at the density at 1 x 106 and are cultured at 37 °C with 5% CO2.). Split the cells when they grow to 60% sub-confluency. The cell line should be subculturing for one or two time before performing the actual assay, and then plate the cells into 24-well plates as triplicate according to the experimental conditions (5 x 104 cells/well). Day 0: Seed cells (density as above-mentioned) in a total volume of 500 μl complete growth media (DMEM/10% FBS). Day 1: Transfection (use ratio of 7XTCL/LEF-firefly luciferase: pRL-SV40-Renilla luciferase as 10: 1; use 1.5 μl TransIT-2020/300 ng of DNA/well). Day 2: Change media 24 h after transfection (optimal). Day 3: Change to serum-deprived media. Day 5: Lyse cells (1x whole cell lysis buffer available from the Dual-Luciferase @ Reporter Assay System) and collect aliquot of supernatant (20 μl) from cell lysis, plate them into 96-well plate. Flash and prime Berthold luminometer with firefly luciferase and renilla luciferase substrate reagents. Firefly luciferase substrate is a derivative of D-luciferin. In response to D-luciferin enzymatic activity (firefly luciferase), a firefly luciferase chemical reaction will generate oxyluciferin and a specific light signal at 560 nm that can be detected by the luminometer. Renilla luciferase substrate is a derivative of Coelenterazine. In response to renilla enzymatic activity (renilla luciferase), a renilla luciferase chemical reaction will generate coelenteramide and a specific light signal at 480 nm that can be detected by the luminometer. 20 μl of each substrate is added sequencially by the luminometer and light signals generated are instantly measured by the luminometer (Light signals are detected at an enclosed chamber of the luminometer at ambient temperature). Read firefly and renilla luciferase signals (firefly luciferase signal is detected at 560 nm and renilla luciferase signal is detected at 480 nm). Note: Fold changes of FL/RL at Wnt3a-stimulated condition is normalized to FL/RL at unstimulated condition. 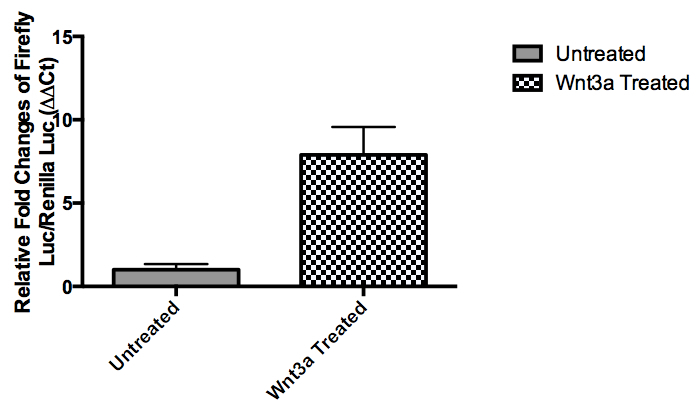 Wnt3a-conditioned media are prepared by collecting supernatant of mouse fibroblast cells stably expressing L-Wnt3a protein, and then diluted in a ratio of 1: 10 in DMEM + 2% FBS + 1% PS. This protocol is adapted from Kim et al. (2010). I thank the current and past members of the Beachy lab, Stanford University, who contributed to the development of this protocol. I acknowledge the Susan G. Komen for the Cure Postdoctoral Fellowship: KG111253. Kim, J., Lee, J. J., Kim, J., Gardner, D. and Beachy, P. A. (2010). Arsenic antagonizes the Hedgehog pathway by preventing ciliary accumulation and reducing stability of the Gli2 transcriptional effector. Proc Natl Acad Sci U S A 107(30): 13432-13437. How to cite: Zhao, C. (2014). Wnt Reporter Activity Assay. Bio-protocol 4(14): e1183. DOI: 10.21769/BioProtoc.1183. Am I missing where you are using the Wnt3a conditioned media? I added it to my 293t-OT cells and they are not fluorescing at all. I got nice results from the experiment. I put my Wnt CM on transfected HEK 293T cells. Cells were transfected with TOP and FOP plasmids.